IDF sets off controlled explosions in a large terror tunnel leading from southern Gaza into sovereign Israeli territory. The Southern Command used new, unpublicized technology to destroy a long and wide terror tunnel whose entrance was in the town of Khan Yunis in southern Gaza Monday afternoon. An IDF spokesperson said an explosion heard hear along the border with southern Gaza was not part of a terror attack or IDF operation inside Gaza, but was instead a controlled explosion intended to destroy the tunnel. "This was an IDF-initiated explosion, and it was controlled," an IDF spokesman said. "There was no terror activity." "[The IDF] neutralized a terror tunnel leading into southern Israel from the vicinity of Khan Yunis." The tunnel was detonated from within Israel, close to the security fence. The (IDF's) actions are in light of this grave and unacceptable violation of Israeli sovereignty." 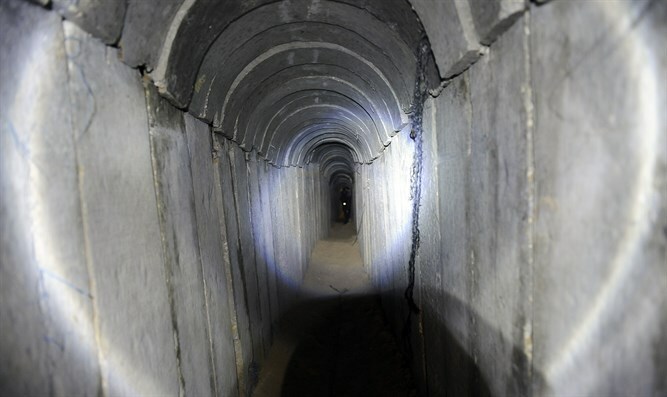 According to Brigadier General Ronen Manelis, the tunnel extended deep into sovereign Israeli territory, and thus posed a serious security threat to Israel. The IDF responded by destroying the tunnel, setting off an explosion in the tunnel as close as possible to the Gaza border, approximately one kilometer (0.6 miles) from the town of Kissufim. According to the IDF, additional units will be sent to the area as a precaution against further security incidents.